“Mom, get off. It’s embarrassing!” Nothing is as upsetting to a kid than their mother trying to show affection. Every time it happens, they react as if you’ve done something horrible. All you want to do is hold their hand and show them you care. All they want to do is be independent and avoid the tag of mommy’s boy or girl. It’s easy to let them get their way such is the fuss they kick up about something small. However, it may be time to turn the tables and put your foot down. And, if they protest, make them aware of these benefits proven by science. They’re teenagers now and that means they understand the world better than anyone else in the history of humanity. Sorry Stephen Hawking, but you’ve been toppled. Thanks to their extreme confidence, kids love to walk around with careless abandon. Children don’t care about a thing, which is freeing to see, yet it’s also dangerous. They are 70,000 pedestrian accidents each year in the US according to the folks at Hazner Law. Hand-holding can prevent your kids from being involved in a nasty and potentially fatal crash. As their mom, you’ll stop them from doing something stupid by the side of the road. They’ll argue otherwise and say it’s unnatural. After all, there aren’t many other moms who make their kids hold hands. Firstly, you’re their mother so other women aren’t of your concern. Well, not yet anyway. Secondly, it’s entirely natural because it happens throughout the animal kingdom. Otters do it, as do penguins and even elephants intertwine their trunks. The reason is unknown because they can’t speak, but one thing is for sure: animals love to hold hands. If anything, it’s unnatural to go against your basic instincts. Children are in a constant state of stress. God, it’s hard work being thirteen years old. We parents can’t understand the pain they are going through right now! Of course, moms get the brunt of their anger because we’re an easy target. 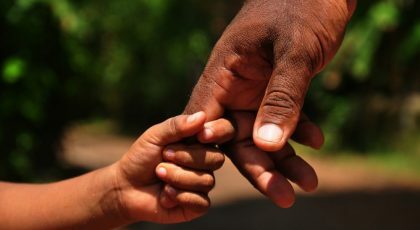 Well, your kids won’t like to hear this, but your love of hand-holding may be the answer. Yep, according to a study on Sage Journals, the human touch has a calming effect. A simple coming together of the hands is instantly reassuring and makes the brain work a little less hard to cope. Who knew you held the answers to their pain in your hands? One of the first things you do when you feel pain is to apply pressure. Whether there is a hole in your skin or a bump on your head, it’s a natural reaction. The reason is that the brain sees pressure as a way to relieve pain. It stems from squeezing a person’s hand when you’re scared or tensing when the pain gets too intense. Your hand provides the perfect amount of tension, which is only you can ease their aches. Do you think your kids will buy any of the above? Probably not, right? !